I'm just going to say it: Shopping is a gamble. While on the one hand, you want to participate in seasonal trends and try out new styles, on the other hand, it's impossible to know how much wear you'll really end up getting out of a new purchase. We get it, which is why we went ahead and identified the four It items of the season and highlighted the outfit photos to prove just why and how each piece will pull its weight in your wardrobe—this season and beyond. 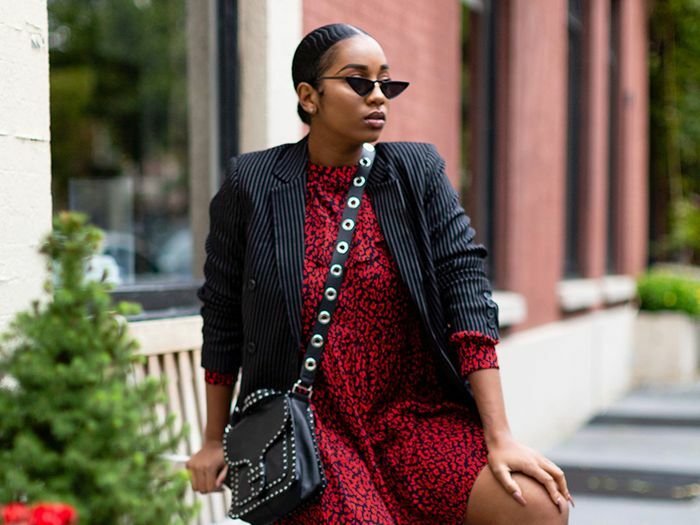 Each piece is the perfect manifestation of fall's biggest trends: the Western trend, the animal-print trend, the neon trend, and the tailoring trend. We're not the only ones who think so, either. Ten of our amazing Who What Wear readers (and two editors—hi, Michelle and Kristen!) test-drove the It pieces and reported back with their honest reviews and three different ways to wear each. But if their inspirational outfit photos are any indication, the reviews are glowing across the board. Ready to discover the fall essentials reviewed by our editors and community? More so than any other trend that's emerged this season, the Western trend has dominated in fashion, but there's no single piece that exemplifies the style better than cowboy boots. 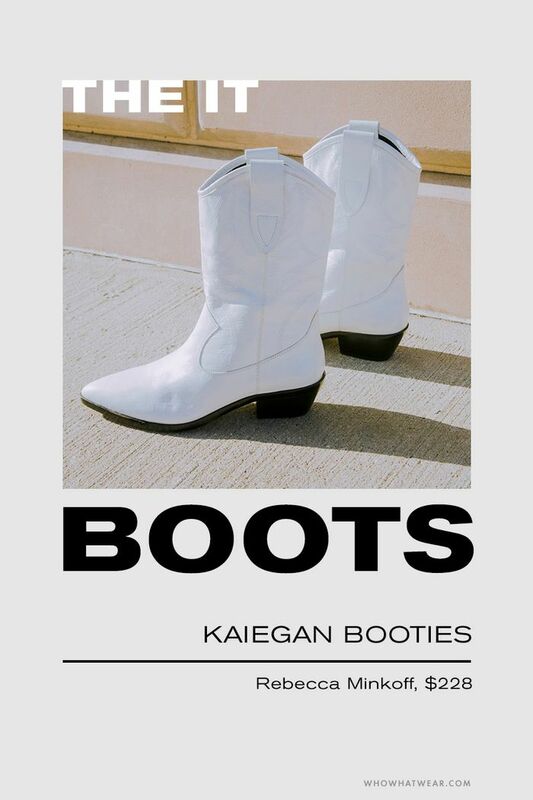 Throughout the season, designers have reimagined cowboy boots for the modern age, and it's Rebecca Minkoff whose slim white leather Kaiegan Booties resonated with stylish women from across the country. "I have been looking for white Western boots for fall and finally found the perfect pair." "They are so versatile, and I plan on wearing them with jeans, dresses, skirts, honestly pretty much anything." "This Rebecca Minkoff pair isn't too clunky and is super flattering on." "These particular boots hit on two major shoe trends this year: Western details and sleek white leather—which makes them a no-brainer It piece in my book." "I was pleasantly surprised how versatile the style is. I was able to wear the boots with three completely different outfits." "Out of the three, my favorite outfit was the trendier look where I paired the boots with biker shorts and an oversize corduroy jacket." "This was super fun to mix and match my day-to-day style with a touch of Western vibes. I mixed them up with some plaid pants because the color of the boots helps bring out the patterns in the pants as well as complete a bold/solid look." "They are perfect for fall and add a little pop to every fall outfit you wear. It's fun bringing them to the streets and styling them differently than their usual Western wear." "I also wore them in two all-white outfits because I love giving room for color and accessories. Although the outfits were almost all white throughout, the boots still make their own statement, which I loved." Leopard has long been a classic print in fashion's history book, but there's no denying that it absolutely exploded on the scene this season. Shoes, bags, jackets, you name it—there's no territory the print hasn't conquered. Despite the print's ubiquity, Miaou's Junior Jeans stand apart from the pack for their utter wearability. Featuring an of-the-moment straight leg with a cropped hem and exposed button fly, it's essentially like other pairs of It blue jeans right now except 10 times cooler, thanks to the animal print. "I've never considered leopard print to be neutral, but the way they lend themselves to so many styling options was a fun surprise and a refreshing break from the norm." "My personal style ranges across the spectrum from girly to casual to tomboy chic, and I had fun showing how these jeans could also make the leap between styles and never lose their cool factor." "Miaou's Junior Jeans in Leopard were more versatile than I could have ever imagined." "Leopard is something I consider to be a seasonless staple, but the print exploded this fall, and I've been very on board." "The print exploded this season, and these pants from Miaou are case in point." "I've been wearing them with everything from a turtleneck and leather jacket to a trench coat and loafers, which is a testament to just how versatile they are." "Leopard is classic. It's a timeless print that goes with everything. For this, I did prints on prints—leopard on leopard is wild in the right way." "For this look, it was all about layers and colors. I wore a turtleneck over a distressed sweater to give it that city feel." "For my last look, I wanted to do a night-out look, so I dressed it up with heels and a crop top." This wouldn't be a trend story if we didn't highlight at least one of the season's most polarizing styles: neon. Vaguely tied to the reemergence of '80s fashion, neon is a micro-trend in and of itself, but green stands apart from the pack. How to go about wearing the tricky color? Ganni has an idea. The Scandinavian It brand's Julliard Mohair Open Knit Sweater only looks intimidating; it's surprisingly wearable. With staples like jeans and white sneakers, this bright sweater makes any outfit utterly cool. "I wanted to style the sweater featuring some of the key trends this fall, like plaid, animal, and skinny jeans." "It was was fun to play with color because I'm normally in blacks and grays." "The neon green sweater definitely makes fall and winter feel more lively." "Don't let the bright color fool you—this sweater was insanely easy to style. For the first look, I paired it with a button skirt and booties for a unique take on a date night out on the town." "I wore it thrown over a simple silky black dress and my go-to sneakers, Air Force 1's, for a casual day out with friends." "And lastly, I chose to wear it with loose raw-hem jeans and strappy heels for a meeting or even a fun dinner party. It's the perfect sweater for fall not only because of its versatility but also because it's honestly just ridiculously cute. I never want to take it off!" "I love how multifaceted this Ganni sweater is!" "I took one look at this sweater and knew right off the top of my head how I wanted to wear it." "To me it's the perfect fall piece because you can layer it if you like. You can also wear it as a staple piece or dress it down, which is exactly what I did." If you've scrolled this far, congrats. Now we're treating you with the most wearable trend of the entire season: smart tailoring. Classic style staples reemerged for fall, giving everyone who doesn't self-describe as a maximalist some hope. We may be biased, but the double-breasted Classic Blazer we designed for our Who What Wear collection is a smart buy. Its structured shape and sharp pinstripes make it a wise investment, but coming in at just $45, it hardly counts as one. "My thought process when executing this collaboration was to show the versatility of a blazer for every type of woman." "Whether corporate, trendy, street, or chic, blazers are a timeless wardrobe staple that literally anyone can wear." "This double-breasted pinstriped blazer is the perfect fall essential for layering over transitional pieces and adding a more tailored element to any ensemble. For this look, I decided to keep things very chic and sleek by pairing it with a turtleneck that I layered under a satin camisole, along with black skinnies and a pair of minimal black pumps." "Call me basic, but I think a blazer is one of those items that automatically elevates an outfit. This Who What Wear Pinstripe Blazer is no exception! Here I paired the blazer with a fringe skirt, tie-neck button-down, and booties for a more polished look." "Unlike most blazers I own, this one is extremely comfortable with stretch throughout so that I can take on whatever the day throws at me (and look good while doing it). The high-waisted jeans, turtleneck, and white booties with the blazer make it easy to take the look from day to night." "I especially love the pinstripes. It's a classic design that adds subtle excitement to an outfit. My hope with this blazer was to style it in ways that seamlessly moved through life with me—whether I was attending a networking event, exploring the city, or heading into the office." "This first look is perfect for a day full of errands—easygoing jeans, a T-shirt, and sneakers." "Here I wanted to try something new to go to the office. I wore a mix of prints, all in the same black-and-white tones to keep the look professional but still quite stylish." "To me, a great blazer is never wrong for a night out. You just need to add a little glamour to the look. I added crystal earrings and a lace bralette to glam it up." If the plethora of outfit ideas in this story don't convince you on at least one of these It pieces, maybe our cost-per-wear analysis will.